Boating in Periyar / Thekkady wild life sanctuary is the main attraction at Periyar Tiger Reserve. Knowing the boating timing is always good to plan your itinerary. 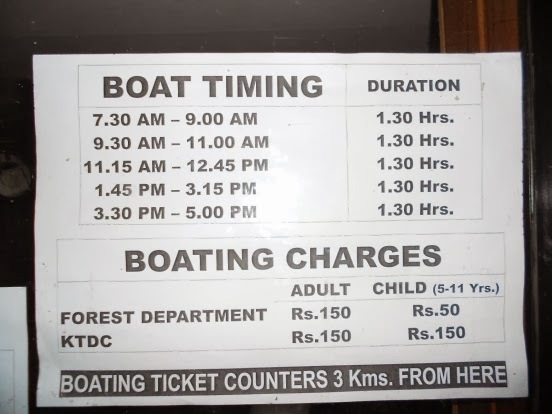 09.30 a.m to 11.00 a.m.
What is the Cost for Thekkady Periyar Sanctuary boat safari ? How to book periyar boating ticket without standing in Que ? What is the duration of Periyar Thekkady Boating ? Other than boating, there are some other shows which you can enjoy. This rate and timings given are as on January 2013.